Remarkable human transformations are happening at Alatheia Therapeutic Riding Center, a program built on a foundation of love, faith and a commitment to serve by Nancy and Glenn Grette and sustained by an army of volunteers and generous sponsors. I was fortunate to be able to witness the magic of Alatheia recently. I later sat down with the Grettes and recorded the interview for my podcast, which can be accessed via iTunes or by accessing artofcommunityncw.com. I had no idea of the healing power that happens when horses are used in a therapeutic manner with individuals who have physical or mental disabilities. The transformations are physical, emotional and cognitive, the Grettes told me. Glenn founded Grette and Associates, an environmental consulting firm with offices in Wenatchee and Tacoma. I was interested to learn that his grandfather was once circulation director at what was then The Wenatchee Daily World back in the 1950s. 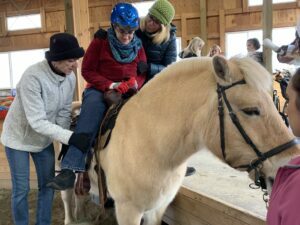 The Grettes, who are enthusiastic recreational riders, discovered what was possible with therapeutic riding in 2010 when friends asked to bring their child who had a physical disability to ride a horse. “When Glenn and I put her on the horse, that was the moment that everything changed… it changed our lives forever and that was the purpose that we had been looking for,” said Nancy. Nancy began volunteering at a similar riding center in Ellensburg and she brought back powerful stories of how the experience with horses was changing lives. Alatheia combines their love for people and their passion for horses in a way that supports their deep Christian commitment to serving mankind. On the four acres that the Grettes own on Sleepy Hollow Heights, they have created a powerful community of more than 120 volunteers, 90 riders with disabilities plus their families, not to mention the generous financial support of businesses and a growing group of donors. Not only does it change the lives of those riding, but inspires hope and confidence in their family members and gives a powerful purpose and meaning in the lives of the volunteers. What started as an idea in 2010 has grown by leaps and bounds and the Grettes are preparing for taking a giant leap forward with the nonprofit that they nourished financially and with love and hard work. They’ve run out of room at the Grette property for the 10 horses and cannot meet the growing number of riders who are willing to come from neighboring counties. With the help of a generous donor, Alatheia Riding Center is purchasing 12 acres in lower Sunnyslope that will ultimately house the entire Alatheia operation. The new property, as envisioned, will include two indoor riding arenas that will allow them to greatly expand the number of people they are serving. The focus of the hour-long sessions is to give riders the maximum amount of control that they can safely handle, Nancy said. Riders, who range from age 3 to 87, make amazing strides in physical, emotional and social abilities during the three, 10-week sessions during the year. Alatheia recently closed for the winter and will start up next spring. For individuals whose bodies are “locked up,” the 300 or so minor physical adjustments that the body must make for every minute a person is on a horse helps unlock their bodies. For those in wheelchairs who have poor muscle tone from, say, cerebral palsy, the experience builds strength. Under the guidance of an instructor trained in this kind of work, individuals work on skills like raising one hand or both hands to increase motor skills. For those in wheelchairs in particular and for most individuals, there is something about being on top a horse above everyone else that creates joy and confidence. Our world typically keeps them trapped below. Alatheia uses only Norwegian fjord horses because of their gentle, calm and patient characteristics. A Norwegian fjord horse will stand still when someone in a wheelchair is lifted via a mechanical lift onto their back. Over time, even profoundly affected individuals make dramatic progress. It is sharing in this experience that makes volunteering for Alatheia such a meaningful experience. Financially, the organization has proven to be a remarkable success. The last fundraiser netted $250,000, which is a magnificent achievement for an eight-year-old nonprofit. The next big goal for Alatheia is a $2.6 million capital campaign to fund the move to the new property. The plan is to launch that campaign in 2019. It’s a big goal, but Alatheia has continued to exceed its lofty goals year after year. Alatheia Riding Center volunteer Carol Busjahn, left, and Executive Director Nancy Grette assist rider Rachel into the saddle of horse Rikky.